Water is a very powerful symbol in our dreams and dreams about water can mean many, many things. Water is shapeless, odorless, tasteless, vital to our life, and part of a never ending cycle. When you dream about water, you will likely find some very insightful information that will help you on your life path. Because there are hundreds of different ways we see water in our lives and in our dreams, the context of the water in your dream is extremely important when interpreting it. Water can be both negative or positive in your dream, so it is important that you consider both possibilities and pay very close attention to the other dream symbols in the dream to fully understand it. What Does a Dream of Water Mean? 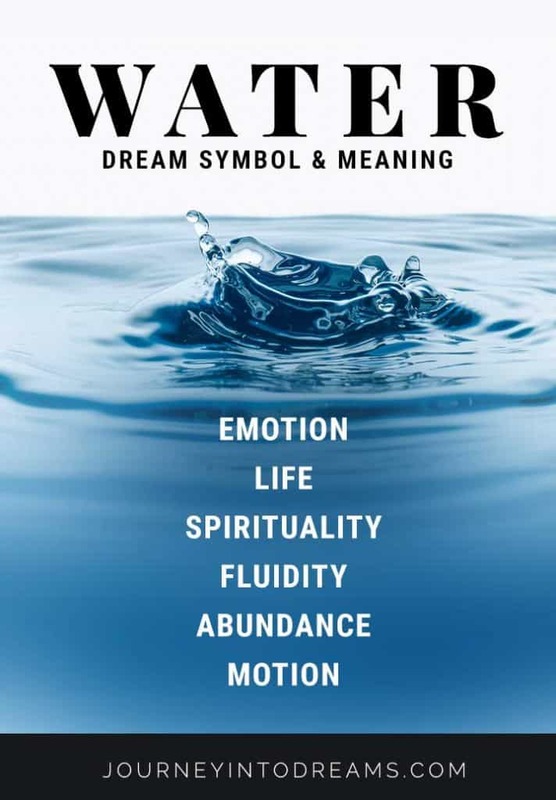 While the type of water you dream about will certainly play a big role in how your interpret your dream, there are also some basic meanings of water in your dream that may also give you some insight on the meaning of your dream. Water will often symbolize emotions and feelings in dreams. The type of water dream you are having, the clarity of the water, and your overall emotional response to the water in the dream will provide some insight on what emotions and feelings you are experiencing. Emotions are an important part of life, and by learning to recognize emotions and how we deal with them in our dreams can help us deal with them in our waking lives. Water is essential for life, and we begin our lives surrounded by water. Therefore it is logical that we would see water to represent life in our dreams as we do in our waking lives as well. Many religions have Holy Water which is used for blessings and other religious purposes. Many myths and legends often portray water to have a very close connection to the spiritual realm. Water is also often used in a variety of religious ceremonies, especially baptism. We often associate water with bathing and cleansing, which can also mean renewal or revival. Water also can change to take on many different forms. In science, water transforms many times through the common cycles associated with weather. Water can evaporate into fog or steam or even freeze into ice. Water is also a very common symbol in dreams about pregnancy and childbirth. We often associate water with new life and new beginnings. There are many ways water can move - through waves, the current of a river, or it can be stagnant in a pond. Dreams about waves and water often are a symbol for the movement and flow in your personal situation. The motion of water can signify the flow of the way things are moving in your life. Water is used for energy in a number of ways in real life and it can also symbolize energy in our dreams. Often times the flow of water in our dreams is a metaphor for the flow of energy and emotions. It's not a coincidence that we often call moving water a current, just as we use the word current to describe movement and flow of electricity. Many people associate water with prosperity and abundance. Without water, it can be difficult to grow foods to eat or sustain life. In many areas of the world, if you live in an area with rich, fertile soil near a river it can mean a great abundance of crops to harvest. If you lived in an area that is prone to droughts or gets little rain, it can mean barren land with few resources. Because water is so necessary for life, it is easy for us to understand how it can be much more precious and valuable than even money itself. If you have a good water source, you are able to sustain life and prosper. To dream of a bath or shower in your dream often symbolize cleansing or purity. If dreaming of a shower - is the water warm, cold, or just right? Is it coming out gently or rough? If dreaming of a bath tub, is the tub filled or shallow? Answering these questions will give you better insight in finding the meaning of your dream. Dreaming of a creek or stream often symbolizes your flow of energy and emotion. It can also reflect your subconscious/conscious self. This can quite literally be an interpretation of the stream of consciousness. If the creek is over flowing, you may be feeling overwhelmed or have an abundance of energy/emotion towards something. If you dream of a dried up creek, it could signify disappointment or a lack of energy and emotion. A dried up creek can also mean your lack of spiritual connection. A creek can sometimes also be a symbol of a path you are on in your life. A river is a very spiritual vessel in dreams, and to dream of one represents the flow of energy and emotion. Is it wide or narrow? Is it a river you recognize? Is the water moving quickly or is the river calm? A river in the forest for example will mean something different than a river in a dessert. How does the river make you feel? Can you see an end to the river, or does it go on forever? All of these things will help provide greater insight into the meaning of the dream. Oceans are vast bodies of salt water, and can signify a number of things. If the ocean is calm it can mean relaxation, tranquility, and peacefulness. If the ocean is rough, it could mean emotional disturbance or uncertainty. If you are dreaming of ocean water, you may also want to consider that ocean water is often salt water. Salt water is not very good tasting, but often times salt can have its own associations our water dream meaning. For example, tears are another form of salty water, so sometimes the ocean can be a vast sea of sorrow and sadness. We also sometimes use the expression "add salt to the wounds" which means to add more pain and misery on top of existing pain. Dreaming of waves in the water knocking you down can mean that your emotions are getting the better of you. You may feel like you are unable to stand up for yourself in a situation, or that you are literally being pounded on in life by a lot of responsibilities and demands from others. Lakes are often associated with calmness and relaxation, as the water is generally calm. Lake water does not usually move, so to dream of a lake could mean you are "bottling up" your emotions or you do not feel as if you are free to express your emotions as much as you would like to be able to. Dreaming of a sea is very similar to dreaming of the ocean. However, our brains often confuse the words "sea" and "see", which means there could be something in your life you need to see more clearly or that you are not "seeing" emotionally. To dream of rain in your dream could mean a couple of different things. If you feel a positive vibe to the dream, then the rain could signify renewal, refreshment, and cleansing. If however you feel a negative vibe to the dream, the rain could symbolize emotional anguish or expression of emotion. Some also believe rain to be a symbol for sadness, forgiveness, and fortune. To dream of water boiling means you are very angry about something. If you are burnt by the water, it suggests that you have been bottling up your anger/emotions and it is causing you pain and suffering. If you dream of ice or snow, it could mean you are quite literally experiencing cold emotions, or that you are denying your true feelings. You may feel like something is preventing you from moving forward in life. To dream of a glass of water signifies thirst. You may actually be dehydrated while you are sleeping, or it can mean you are thirsty for something else in your life. Also ask yourself, is the glass half empty or half-full? It will provide whether you see things with optimism or pessimism. To dream of a glass of water overflowing means abundance. You may wish to also look at the meaning of food in dreams and what it means to eat in a dream. To see a swimming pool in your dream may have a number of meanings. Think carefully about the shape and size of the pool, and how you feel about swimming. Someone who swims everyday for exercise would have a different meaning for this dream than someone who is afraid of water! A swimming pool can mean feeling confined, or it can mean bottling up fears and emotions. If you enjoy swimming, it could mean feeling refreshed and invigorated. To see a puddle of water in your dreams means you may feel as if you (or your feelings) are unimportant. While a puddle is a much smaller body of water than say a lake or an ocean, it is still water nonetheless and often has a connection to emotion. To dream of a muddy puddle signifies confusion or feeling unclear about something in your life. A puddle could also mean that you feel like you are experiencing difficult times financially or emotionally, or perhaps even both. To dream you are splashed by water may mean you need a "wake up call" or to be alerted to something important going on in your life. You may also literally be trying to "make a splash in the world" and want others to notice you. Being splashed could also mean you are in need of more playfulness and fun in your life. 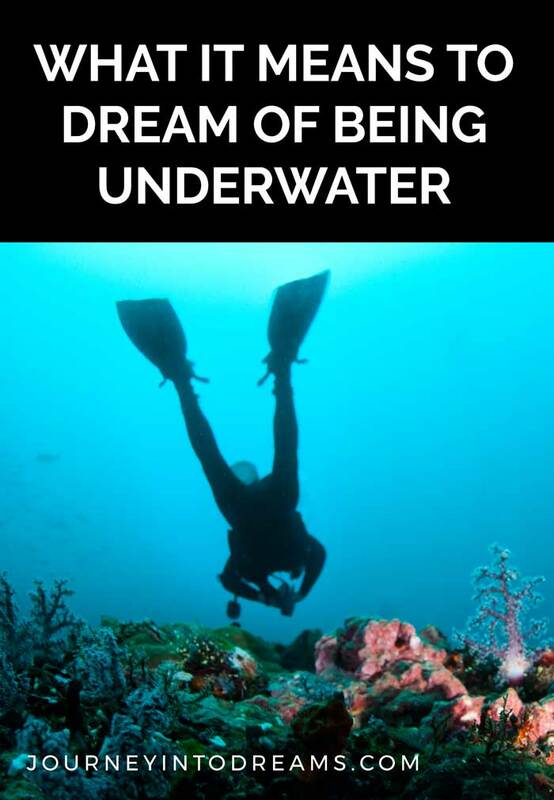 To dream of being underwater often means you are exploring your subconsciousness or are having deep emotions at the time. Often times going deep under water can mean that you have deeper issues that are not obvious on the surface of a situation. If you dream of scuba diving, it could mean that you are in need of special preparation or equipment to deal with the current situation in your life. Water sometimes will appear in our dreams as waterfalls and fountains. These are very powerful forces of water, which can sometimes be quite majestic. Dreaming of a waterfall can signify cleansing or release of emotions. It can symbolize letting go or forgiveness. If you are standing underneath a water fall, it can mean you feel overwhelmed by emotion or problems. If you dream that you are about to go over a waterfall, it can mean that you feel like your emotions are out of control. You may feel like you have no control to be able to change the current path of events in your life. Dreaming about water in an aquarium? This can often mean you are feeling confined in some way, or that you must come to terms with accepting your emotions. See aquarium dream meaning to learn more. With so many different possible meanings for water in a dream, it's important that you ask yourself some clarifying questions that will better help you to understand what the dream of water means. There are many questions you can ask yourself to help interpret the dream. What emotions did you feel during the dream? Because water is often associated with feelings and emotions in dream symbolism, it is very important to pay attention to the feelings and emotions you felt during the dream. Did you feel sad, angry, or overwhelmed? Were you feeling peaceful and relaxed? Identifying your emotions and relating them to your waking life events will help you better understand your dream. What Kind of Water Was in Your Dream? Water comes in so many forms, the type of water dream you had will make a big difference in the interpretation. There is a big difference between dreaming about an ocean and a glass of water! Was the Water Clear, Clouded, or Dirty? The color and transparency of the water can have great significance in a dream. For example, if you dream of crystal clear water you can see through, it may symbolize you have great clarity on a situation in your life. If instead you dream of dirty, polluted water, it may mean you are feeling as if something has been tainted or you are feeling uncertain about situations in your life. What Other Objects and People Were in the Dream? You should always try to think of the context of water in the dream in relation to other objects and people. For example, if you dream of a friend swimming in the water and having a good time, that would mean something completely different than being on a boat alone out at sea during a storm. You can use our free online dream dictionary to lookup dream symbols. Understanding what different symbols might mean can help you better piece together what a dream means in context with your daily waking life. Rarely do we dream of just water and nothing else! If you dream about water, you may want to also look up the meaning of the other different symbols that appear in your dreams. As you can see, water can mean and symbolism a number of things in dream analysis. It is very common to dream of water, and when you understand the meaning of water in your dreams it can certainly help you in your waking life as well! Do you have any dream experiences with water you would like to share? Any interpretations or meanings for water we may have missed? Share your thoughts in the comments section below! I dream of a muddy water overflowing in the creek and my Friend is there starring on it and also me what is this mean? When he noticed I was going under the water, he got out of his tub & pulled the plug to drain my tub. The river is fast moving and brown color like muddy while the sea is just calm and clear. I was in a crystal clear and very calm part of the ocean, carribean like.. there was vegetation under the water.. All was crystal clear. I remember being just before fully submerging under water all was clear & then as soon as I submerged all became even more clear, beautiful in total peace. As I was submerging fear that I couldn’t breathe arose.. But then once fully submerged I relaxed and somehow started breathing underwater. The calm, beauty and clarity I settled into was out of this world. It was an incredible moment. I had a dream where a boy whom I don’t know personally but I do know of was lying in my bathtub submerged in water. He was awake and alive and he was also fully clothed. For some reason I bent over the side of the tub and we kissed and I remember in the dream feeling like us kissing was the only thing keeping him alive, as if I was exchanging oxygen with him. The feelings were ones of genuine love, not lust. It has been bothering me. I feel like I need to know what this could mean. In two separate scenarios in the same dream, my dear friend ran ahead of me saying she was going for a swim and rushed to an outdoor swimming pool. she was in already barefoot and in a swimsuit and i think a floater around her waist. this is my dream so idk what it means for her. Hi. Dreamt of a lovely ocean seen from a hillside. Clear light blue near the beach and deeper a little further out. When my friends and i went down to go swim there was always something in the shallows, manmade, like steam train or machinery or trash polluting the water so that we couldn’t swim. Disappointing to say the least. Hi,I was sitting on top of the sea or ocean with my son very calmly,we were adoring each other with no fear whatsoever,I woke up very happy content it is still . magical and I still feel good. I dreamed or had a vision of standing by a outside pool of clear water no one was in it. I dreamed I was walking by myself and stepped with my left foot into a puddle. It was icy on the top and when I stepped it broke but the puddle came up to way above my knee. I quickly pulled my leg out with such force I woke myself up. Jenkins my leg violently as I did. My dream was that I was near grave yard, some people were dead including granny…then later I prayed to God for powers, he granted me and I performed miracle that made clean water come from the mountain that made the dead awake.. Please advice me on why was the meaning of the dream. Because the place was dry ,so I performed a miracle and water came from underground and on top of the mountain, people were happy…. Water in my dream was dark but when I touched it, it was luminescent with beautiful colors and I can lay on top and I would not sink. It was a huge ocean with beautiful caves surrounding it. I felt happy and in awe by the colors. got there I was worried about getting into the water because I was afraid of something big swimming in there maybe whales in the water . I had a dream of a white toilet that was very clean and the water was crystal clear. When I looked in the toilet, I felt calm and pleased with what I was looking at. I dream about swimming in the ocean. As I go through, the water is gradually disappear until their is nothing left. What does it mean?